Exhilarating, thought-provoking, and unexpectedly hilarious, the latest effort from cinema auteur Spike Lee proves to be a resounding success, and is easily one of the director’s best films, and makes an exceptional companion piece to his 1989 masterpiece, Do the Right Thing, which masterfully combined humour with horror. After a strikingly filmed, highly provocative opening sequence, where an increasingly hysterical historian (a pitch-perfect performance from Alec Baldwin) ineptly tries to explain and defend the abhorrently racist rule-of-law inflicted upon African Americans for many decades, we are introduced to the film’s main protagonist, Ron Stallworth (John David Washington, son of Denzel), who wants to join the Colorado Springs Police Department. The era is the 1970’s. Interviewed by Chief Bridges (Robert John Burke) and Sergeant Trapp (Ken Garito), Stallworth already meets some resistance as possibly being the first black officer at the Department, but is eventually, if cautiously, accepted, but placed on one of the lowest rungs of the employment ladder. Wanting something a bit more challenging, Stallworth offers himself as an undercover agent, which is laughed at by his superiors until an important gathering is about to take place in town, where an ex-Black Panther member will be giving a potentially incendiary speech. Teamed with fellow officers Flip Zimmerman (Adam Driver) and Jimmy Creek (Michael Buscemi), the assignment is an eye-opener for the rookie, not only in learning the ropes as an officer of the law, but also in hearing what the speaker has to say to the enthusiastic crowd. A connection is made with one of the event organisers, Patrice Dumas (Laura Harrier). Gaining confidence from his Chief, Stallworth spontaneously responds by phone to an advertisement he reads, which is trying to recruit new members for the Klu Klux Klan, and is surprised when he is able to set up a future meeting with the leader of their local office, Walter (Ryan Eggold). As his skin colour may cause obvious problems, Zimmerman is sent in as the alternate Ron Stallworth, and he manages to ingratiate himself with this repellent group, rubbing shoulders with people such as Felix (Jasper Paakkonen), his wife Connie (Ashlie Atkinson), and Ivanhoe (Paul Walter Hauser). The actual Stallworth, via several phone calls, even manages to befriend the face of the Klan, David Duke (Topher Grace). With talk of a violent, terrorist attack building momentum amongst key Klan supporters, Stallworth, Zimmerman, and company will have to put their lives on the line to prevent the strike, which could very well lead to the loss of innocent lives. 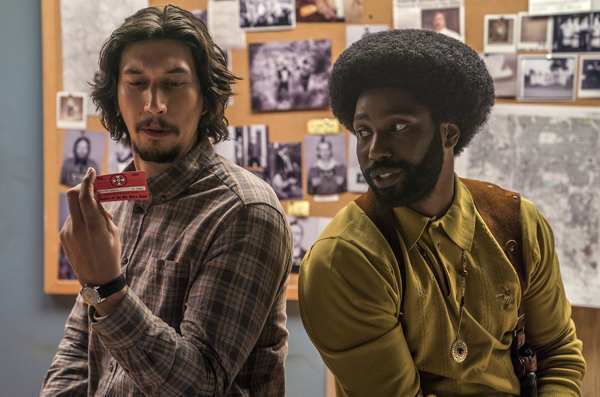 Blackkklansman is a shot of pure adrenalin, delivered with such precision by Lee that it is a joy in itself seeing such a gifted film-maker working at the peak of his powers. At the age of 61, Lee’s energy hasn’t diminished in the slightest, and his convictions, beliefs, and abilities are as strong as they were thirty-odd years ago. Lee isn’t afraid to confront and shock his audience, and Blackkklansman is a prime example of the way he challenges movie-goers to question what they think is the accepted status quo, and why offensive, entrenched points of view regarding race and colour need to be defeated and quashed. I cannot praise the performances enough. Washington exudes considerable charisma (showing that acting definitely runs in the family), and he superbly enables Stallworth to beautifully symbolise how inclusive law enforcement should be, while scrutinising hurdles that continue to keep that tense barrier between police and the African American community very much alive. Driver (Silence, Paterson, Inside Llewyn Davis) continues his terrific track record (even if he is continually wasted in the new Star Wars movies), and the chemistry between he and Washington is sensational, keeping the story’s heartbeat healthy and vigorous, as well as providing many of the film’s funniest moments. The supporting cast all deserve special mention, with standouts being Harrier, Burke, and Paakkonen. The screenplay, by Charlie Wachtel, David Rabinowitz, Kevin Willmott (Chi-raq), and Lee (based on Stallworth’s 2014 memoirs), is a mix of exuberance and intelligence, and interlocks the attitudes and climate of the past and present with incredible skill, mixing slogans, politics, and dialogue to eerie effect. While the movie is hugely entertaining, there is always a serious undercurrent running underneath, surfacing at the regular intervals to pull the rug from under the audience, reminding them of issues and problems that have sadly continued through to this day. This includes an examination of cinema itself, with scathing indictments of some of history’s most iconic imagery, notably Gone with the Wind and especially D.W. Griffith’s notorious Birth of a Nation (the scenes from the latter have never looked so chilling as they do here). There is even a discussion on the various role models that headline the immensely popular blaxploitation films that were filling theatres at the time. The production crew additionally deserve rapturous applause, including cinematographer Chayse Irvin (who photographed Lee’s impressive Pass Over), production designer Curt Beech (She’s Gotta Have It TV series), costume designer Marci Rodgers (Pass Over, She’s Gotta Have It TV series, and worked on the under-rated Chi-raq), regular composer Terence Blanchard (who has scored many of Lee’s films since Jungle Fever in 1991), and longtime editor Barry Alexander Brown (whose work with Lee dates back to School Daze in 1988). Blackkklansman is one of the most invigorating and significant films to come out during 2018, and is the type of endeavour which keeps one’s faith in the power and relevance of cinema. Lee wants us to view the state of the world around us, the way in which we participate in that environment, and how we truly look at and treat those around us. Lee’s heartfelt polemic will hopefully succeed in generating genuine discussion, but will also go down as one of the most entertaining features of his career. On top of that, it should move on to become one of the prominent frontrunners at next year’s Academy Awards.